It’s a sunny Monday afternoon. I’m walking towards Sheffield city centre with my two-year-old son and my good friend Dan. My son has fallen asleep. There isn’t a lot of point going to the museum now. So we need something else to do while we wait for little legs to wake up. 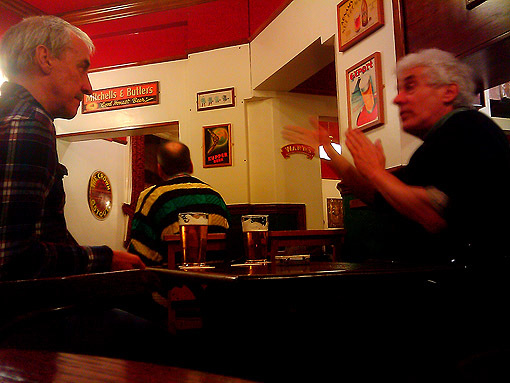 The Red Deer is a pub I’ve neglected a bit in recent months. At this end of the city centre I’ve tended towards the University Arms lately. But the Uni Arms is shut for a month or two while they have some work done, so it’s a good chance to get reacquainted with the Deer. Just as we cross the threshold of the pub, my son wakes up. It’s too late to turn back. We’ve mentally ordered two pints of Lancaster Pale, so the bar staff must be mentally pulling them by now. That means we’ll have to mentally pay for them. And you can’t leave a beer you’ve already paid for. That would be mental. I always say I’d still go to the pub even if I couldn’t drink beer. Fortunately, this seems to be a hereditary trait. My little one is happy just to sit there, looking at the lights and windows, reading books, chatting away to us all and stealing my chips. It’s a far cry from a year or so ago, when we used to take him to the Wetherspoons for lunch and he’d charge around in a vortex of destruction like a Tasmanian devil. Or like the cartoon one anyway. We’re back at the Red Deer doing the same thing on Saturday afternoon, this time with Cara around too, and then at the Rutland Arms, so it’s a good job my son enjoys it so much. The Red Deer is its usual self, which means friendly and pleasant with super beer and American graduate students. On Sunday night the Blake Hotel (pictured above) is its usual self too. This means friendly and pleasant with stunning beer and prices starting at exactly two quid a pint. Somebody’s dog decides to sprint a circuit of the pub with somebody’s scarf in its mouth. This brings everyone in the Blake together for a minute, as we all look up from our separate conversations to share our bemusement, and then amusement, with little more than facial expressions. Sometimes that’s enough. Those “family pubs” are universally appalling. Fortunately, though, I live in a city where it’s quite easy for a family to have a nice time in the pub without going anywhere near one of them.